As communion with the Sunday paper has replaced church-going [she writes in 1979], there is a tendency to forget that sermons had a one time been coupled with news about local and foreign affairs, real estate transactions, and other mundane matters. 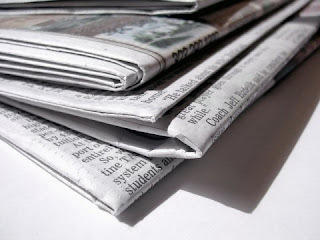 After printing, however, news gathering and circulation were handled more efficiently under lay auspices. Such considerations might be noted when thinking about the 'secularization' of 'desacralization' of Western Christendom. For in all regions (to go beyond the 18th century for a moment), the pulpit was ultimately displace by the periodical press and dictum 'nothing sacred' came to characterize the journalist's career. She goes on to note that print culture broke the link between community and communication (we don't often gather to hear the public speech at church or areopogus). But "communal solidarity was diminished; vicarious participation in more distant events was also enhanced... links to larger collective units were being forged." Elizabeth Eisenstein still hold the definitive work the subject matter defined by her book The Printing Press as an Agent of Change (Volumes 1 and 2 in One) .